Blowout Sale! 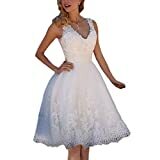 Up to 58% off on Dresses at SCRHI. Top brands include Lalagen, HOMEYEE, MUADRESS, Lamilus, MUXXN, GRACE KARIN, Eliacher, Miusol, MakeMeChic, VfEmage, MIDOSOO, Neineiwu, Zalalus, Barlver, ABaowedding, & Utyful. Hurry! Limited time offers. Offers valid only while supplies last.